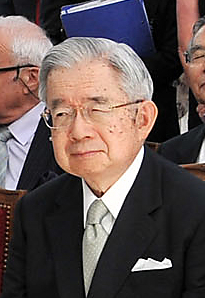 Masahito, Prince Hitachi (常陸宮正仁親王, Hitachi-no-miya Masahito Shinnō, born 28 November 1935) is a member of the Imperial House of Japan and the younger brother of Emperor Akihito. He is the second son and sixth born child of Emperor Shōwa and Empress Kōjun and is fourth in line to the Chrysanthemum Throne. Prince Hitachi is mainly known for philanthropic activities and his research on the causes of cancer. Prince Hitachi and his wife Princess Hitachi have their official residence in a palace in large gardens off Komazawadori in Higashi, Shibuya. They have no children. This page was last changed on 15 January 2018, at 17:09.